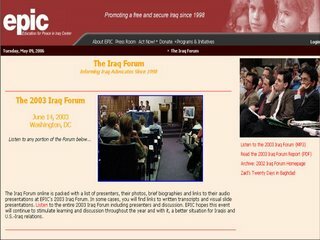 A month before Joe Wilson wrote his historically inaccurate editorial in the New York Times, he was chumming with Anti-Bush conspirator Ray McGovern at the The Education for Peace in Iraq Center’s (EPIC) 2003 Iraq Forum on June 14, 2003, where both men gave speeches on Iraq’s attempts to acquire uranium from Niger. Though the investigation into who “outed” Plame was premised on the notion that (a) her identity was not publicly known before Robert Novak’s article in July 2003 and (b) the disclosure came from the Administration—particularly persons in the White House to somehow “punish” Wilson, there is increasing evidence that Wilson himself widely divulged that information to burnish his own credentials as an expert. I reported long ago that at the June 14, 2003 EPIC conference (where he listed his wife as Valerie Plame in the program) Wilson revealed he was the Ambassador who was the source for the May 2003 Nicholas Kristof piece and the June 2003 Walter Pincus piece, in which he falsely accused the Administration of jiggering evidence and disclosed his wife’s name. There’s ample reason to believe he flourished more than just her name, but as well her connection to the agency in greater detail regularly, which makes the entire investigation into who publicly disclosed her identity particularly ridiculous. 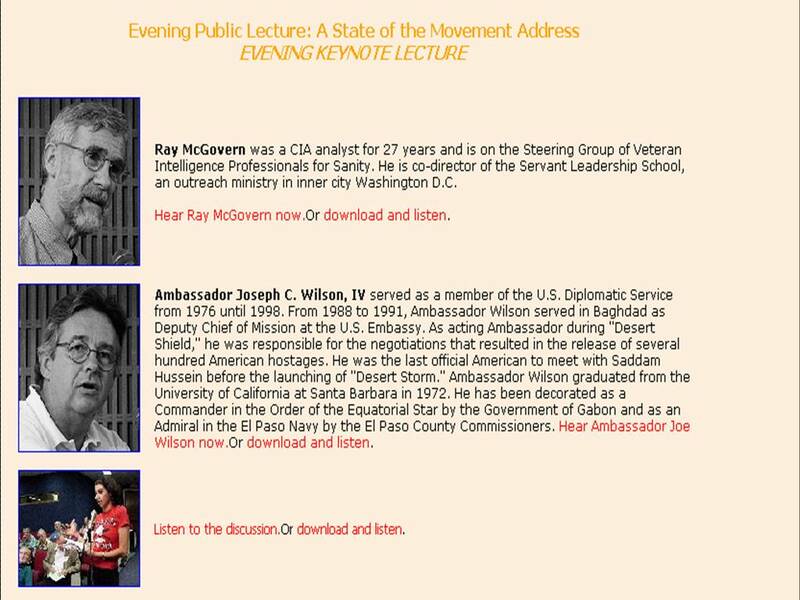 Ray McGovern, who was the other featured speaker at the EPIC conference and a leading member of the VIPs—one who openly called on CIA employees to leak – is a named source. A second source is described only as a “former state department official with ties to the CIA.” I strongly suspect “former state department official” is none other than Ambassador Wilson himself, referring to his wife’s employment to strengthen his credentials. 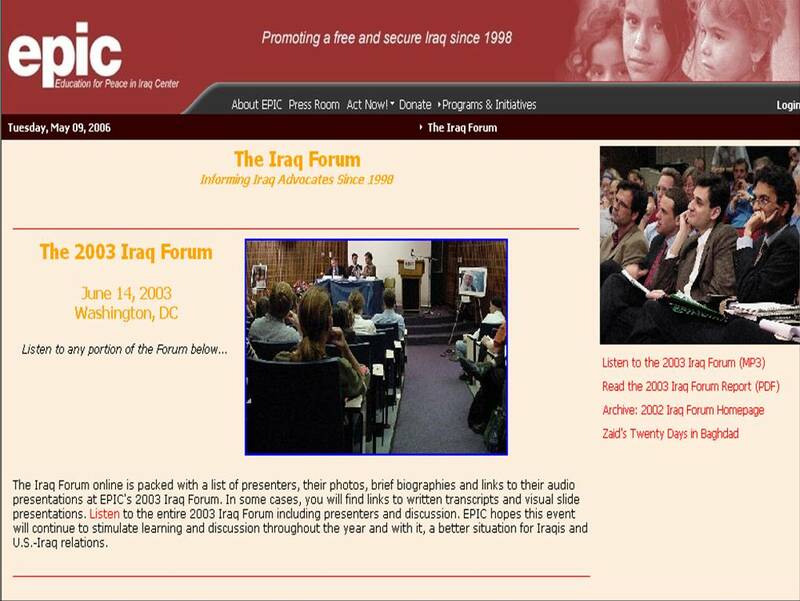 Ray McGovern and Joe Wilson at the 2003 Iraq Forum on June 14, 2003, a month before Wilson’s infamous and inaccurate editorial at the New York Times. It is therefore evident that beginning in May of 2003 -with his interview with Nicholas Kristof-Wilson was pushing his story and many reporters knew who he was before he wrote his July 6, 2003 op ed in the New York Times. It is also apparent that beginning about the same time he told reporters of his connection to the CIA, that is, that his wife worked there on WMD matters. 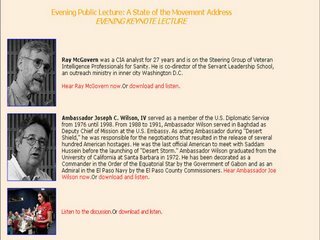 It would be interesting to know how Ray McGovern got his flawed information on Niger and how much he and Ambassador Wilson shared about this central topic during the forum weekend. The Strata-Sphere has more on the Niger forgeries.